Luna is considered a decent carry. She deal high phisical bouncing damage and also deal a nice magical damage. You need to farms a lot and in late game you will be a monster that eating all of the enemy players. Unfortunately. you are a very squishy hero on early-mid game, you need a tanker taht will tank the damages for you. Deal a decent damage to a single targeted hero. This ability also gives a ministun that will cancel teleportation and also channeling. This is a nice ability to kill an enemy who try to escape. He then receive a decent amount of damage and cannot escape. Also good for harassing on early game for controlling the lane. Gives you a Bouncing attack so your glaives will keep bouncing and damaging other enemies behind your target. Also bouncing via buildings (this will really helps in destroying enemy's Barracks). On early game it will really helps in jungling and farming on the lane. Your farms should be faster with this skill. Combined with your 3rd skill (increase your damage), this skill will makes you deal a high damage that bouncing from one enemy to another. With this skill, all of the enemy heroes in teamfight will feel your attack and have their HP reduced quickly. Gives bonus damage to you and your nearby allies . This will helps you in dealing more physical damage to creeps and heroes. You also will farms faster and jungling faster. This also helps another heroes in your team with +damage to every teammates. The ability should really helps in teamfight which physical damage is important to kill all the enemies on late game. 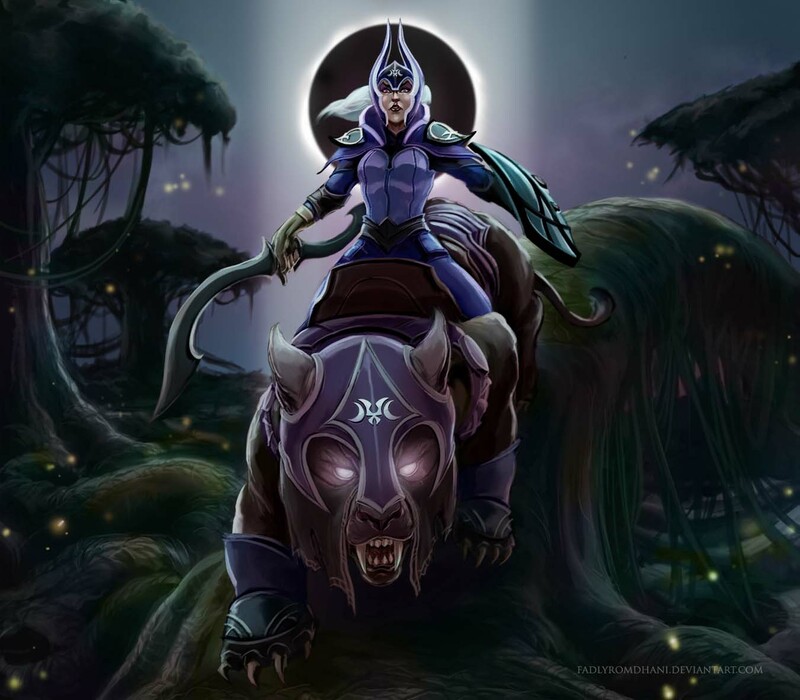 Can be comboed with Drow Ranger & Vengeful Spirit to max its + Damage that will give your team a very high + damage. All enemies around you will receive lots of Lucent beam. Lucent beam will deal damage randomly, so the less the enemy the better. An alone target will receives all the Lucent Damage and die quickly. Why take Lunar Blessing on Level 1? this will helps you in lasthitting every creeps because of it's additional damage. Why Lucent Beam maxed first? You should max this immediately. This skill is a high damage nuke that should be maxed on early game. Because in early game, enemy's Hp is still relatively low. enemy harassing will be easy. In early game I recommend you to take 1 level of Lunar Blessing to increase your damage and helps you in last hitting the creeps. Your main job is to farm as much as you can. Try to last hits carefully so you can earn gold quickly. You should also harass enemy using Lucent Beam and make them uncomfortable in lasthitting. If you need to deny, that is ok, but you must remember that your main job is to last hits. Beware of enemy's attempt to gank you. Your team's needs a vision so your support better buy the Observer Wards. We recommend you to keep farming everywhere, you should farming in your lane, you should also farming in the jungle. The faster you got your core item, the higher the chance your team will win the teamfight. You can also helps your team in some teamfight if you think your allies can't handle the teamfight with just 4 person . 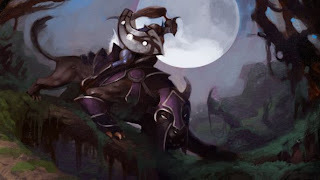 You have Eclipse which is a very nice ultimate in a teamfight because of it's high damage. Here is your time to show off and come to the battleground. You should already have the items you need, maybe Manta Style, or DPS item or another nice items. You should start a teamfight using Eclipse, and then just right click. You have a very high right click damage that bouincing. You Just need to wait until all enemies are all dies. This hero have a very nice ability to destroys all of the enemies. Your bouncing damage is also have a decent damage from the Lunar Blessing so the enemies that receive the bounced damage of your glaive will have their HP reduced quickly. After you won the teamfight, you better fight the Roshan to get the Aegis for your safety. And then after that, you can push conveniently. Why Power Threads? It will gives you attack speed, thats what you need, attack speed and and also damages. Power threads is also a flexible shoes, you can change it into Pt STR, Pt AGI, or Pt INT for what you need the most. Why Ring of Aquila? You need this to increase your damage to helps you farm and harass enemies. You also need the +mana regeneration for you and your team. Also good in giving additional stats. Why Manta Style? Creates 2 illusion of yourself to attack the enemy. Because your damage is high, this item will reach its maximum potential beecause your illusion will also deal some high damage. This items also provide a defense mechanism for you because your opponent will be confused and don't know whose to attack, they should guess where is the real you. 4. Helm of the Dominator and upgrade it into Satanic Later. This items gives you lifesteal ability and also add some damage. With lifesteal you can survive in a tough teamfight. This item also gives you the ability to dominate a creep, we recommend you to dominate Alpha Wolf to increase your damage. You can also buy MKB, its up to you, both MKB and Daedlus is good. Supportive heroes have disables and nice skills to helps carries and makes a teamfight easier for the team.